Neuron loss is the cardinal characteristic of neurodegenerative diseases. Regulation of adult neurogenesis, especially the induction of neuronal differentiation, is important in developing therapies to promote neuronal regeneration from nerve injury or neurological disorders. Neuronal differentiation is extremely complicated because it can occur in different cell types and be caused by a variety of inducers. In recent years, medicinal plant-derived natural compounds have received extensive attention as major sources of new therapeutic agents for treating neurological disorders and they exert their effects by promoting adult neurogenesis. In this study, we summarized the detailed research progress on the active natural compounds with potential neuroprotective effects and their molecular mechanisms on inducing neuronal differentiation and morphogenesis in NS/PCs, MSCs, PC12 cells and neuroblastoma cells. The active ingredients derived from natural plants that efficacious in promoting neuronal differentiation and neurite outgrowth include phenolics, flavonoids, alkaloids, coumarins, terpenes, quinines, glycosides, iridoids, volatile oils and others (xanthone, isothiocyanate). Studies have shown that above natural products exert the promotion effects via regulating many factors involve in the process of neurogenesis, including specific proteins (DCX, β IIItubulin, MAP-2, NSE, Tau, Nestin, GAP-43, Neurofilaments, GFAP), related genes and proteins (Stat3, Hes1, Mash1, NeuroD1, SIRT1, Hsp70, Reggie-1, Cyclin D1), transcription factors (CREB, Nkx-2.5, Ngn1), neurotrophins (BDNF, NGF, NT-3) and signaling pathways (JAK/STAT, Wnt/β- catenin, MEK-ERK1/2, PI3K/Akt, Akt/GSK-3β/β-catenin, PKA/GSK3β/β-catenin, Notch, BMP, Ca2+/CaMKII/ATF1, Nrf2/HO-1). The development of neuro-modulating natural products is of great value for the prevention or treatment of neurodegenerative diseases and for neuronal regenerative medicine. CNS: Central Nervous System; NS/PCs: Neural Stem/Progenitor Cells; NSCs: Neural Stem Cells; NPCs: Neural Precursor Cells; GFAP: Glial Fibrillary Acidic Portein; BDNF: Brain Derived Neurotrophic Factor; Stat3: Signal Transducer And Activator Of Transcription 3; bHLH: Basic Helix-Loop-Helix; MAP-2 : Microtubule Associated Protein-2; Aβ: β-Amyloid; AD: Alzheimer’s Disease; GSK: Glycogen Synthase Kinase; PI3K: Phosphatidylinositol 3-Kinase; Tuj-1: β III-Tubulin; MAPK: Mitogen- Activated Protein Kinase; JNKs: C-Jun NH2- Termianl Kinases; CAV-1: Caveolin-1; NGF: Nerve Growth Factor; TrkA and TrkB: Tyrosine Kinase Receptor A and B; CREB: cAMPResponsive Element Binding Protein; Elk-1: E-26-Like Protein 1; NMDA: N-Methyl-DAspartate; NF-H: Neurofilaments; ERK1/2: Extracellular Signal-Regulated Kinase 1/2; SDF- 1: Stromal Cell-Derived Factor 1; CXCR4: Chemokine Receptor 4; ES: Embryonic Stem; MSCs:Mesenchymal Stem Cells; Eno2/NSE: Neuronal Enolase 2; Hes1: Hairy Enhancer of Split 1; NT-3: Neurotrophin-3; SIRT1: Sirtuin 1; hBM-MSCs: Human Bone Marrow Mesenchymal Stem Cells; hCBMSCs: Human Cord Blood Stem Cells; PKA: Protein Kinase A; hUMSCs: Human Umbilical Cord-Derived Mesenchymal Stem Cells:; Hsp70: Heat Shock Protein 70; FGF 2: Fibroblast Growth Factor 2; NSE: Neuron-Specific Enolase; PKC: Protein Kinase C; GAP-43: Growth-Associated Protein-43; TopoIIβ: Topoisomerase IIβ; Sp1: Specificity Protein 1; NF-Y: Nuclear Factor Y; NF-L: Neurofilament-L; MEK1/2: MAPK/ERK Kinase 1/2. Human neurodegenerative disorders, such as stroke and Parkinson’s and Alzheimer’s diseases, are all characterized by neuronal cell loss and associated with corresponding loss of function and disabilities . Neurogenesis, a process of generating new neurons, is responsible for neuronal regeneration and occurs throughout life in the mammalian central nervous system (CNS) . Developing therapeutic approaches that target on neuronal differentiation and adult neurogenesis will be greatly beneficial for the regeneration of neurons or reconstruction of synaptic networks in neurological diseases such as neurodegenerative diseases, brain injuries and mood disorders . Neuronal differentiation in the early development involves neuronal fate determination and a series of morphological changes of the newborn neurons, including neurite initiation, extension, and maturation of axons and dendrites . Precise regulation of these developmental processes determines accurate formation of synaptic connections and thus the functioning of neuronal network. Neural differentiation, controlled by appropriate regulation of extrinsic signaling factors and intrinsic cellspecific genes, is relevant to a wide range of biological events in the CNS, including neural development, neurological damage and repair, neurodegenerative disorders, and the formation and treatment of nervous system neoplasms . Neuronal differentiation is extremely complicated because it can occur in different cell types and be caused by a variety of inducers . In recent years, considerable attention has been paid to the identification of new differentiation-related genes, proteins and signaling pathways to gain insights into the mechanisms involved in differentiation and possible treatments of neurobiological disorders . A wide variety of compounds derived from natural sources exhibit potent bioactivities on neuronal differentiation and morphogenesis . Natural compounds that can protect neurons or increase adult neurogenesis, both in vitro and in vivo, hold promise for the treatment of nervous system disorders. Currently, numerous natural compounds have been shown to play a role in the biological processes of neuronal differentiation, and that raises the possibility of curing neuron injury and/or neurodegenerative diseases. In this paper, we summarized the detailed research progress on the active natural compounds with potential neuroprotective effects and their molecular mechanisms on inducing neuronal differentiation and morphogenesis in NS/PCs, MSCs, PC12 cells and neuroblastoma cells. Neurogenesis is a natural process, comprising cellular proliferation, differentiation, and migration and is responsible for brain regeneration . Adult-born neurons in specific brain areas, such as the subgranular zone (SGZ) of the hippocampal dentate gyrus (DG) and the subventricular zone (SVZ) of the lateral ventricles, also experience differentiation processes which, in many levels, resemble embryonic neuronal differentiation . In particular, neural stem/ progenitor cells (NS/PCs) at the SGZ are the main source of adult-born excitatory granule neurons in the DG. Under intrinsic control or external stimuli, NS/PCs undergo multi-lineage differentiation and give rise to new neurons, which continue to mature and integrate to the local neural circuits. The persistence of adult neurogenesis raises the possibility that the resident or transplanted NSCs could replace the neurons lost in brain injury or neurodegenerative disease . Neural stem cells (NSCs) are a unique population of cells that exhibit stem cell properties, including self-renewal, multipotency, and differentiation of the progeny into the three primary CNS phenotypes: neurons, astrocytes, and oligodendrocytes . Recent studies have shown that NSCs are present in the SVZ of the lateral ventricles and the SGZ of the hippocampal DG in the adult mouse, rat, nonhuman primate, and human brain. Newly generated cells in the SGZ can differentiate into mature, functional neurons and integrate into the DG as granule cells involved in memory formation. NSCs have been isolated from the SVZ of mammalian CNS and can be maintained in vitro for extended periods of time without loss of their proliferation or differentiation potential . Because of the ability to support neurogenesis throughout adulthood and exert immunomodulatory properties, NSCs have been evaluated as a renewable source of neural precursors for regenerative transplantation in various CNS diseases, including degenerative disorders, injury, and cancers [13,14]. Previous studies have suggested that the proliferation and differentiation of NS/ PCs can be influenced by the effects of extrinsic and intrinsic signals coming from medium components such as growth factors, cytokines and teratogens, leading to alteration of the cell-fate choice that determines cell division, survival and cell cycle exit . The factors maintaining the self-renewal capacity of NSCs have been widely studied. The Notch signaling pathway plays a pivotal role in maintaining the NSC pool . Bone morphogenetic proteins (BMPs)  and inhibitory basic helix loop helix (bHLH) transcription factors  also contribute to the regulation of self-renewal of NSCs. The neurotrophin factor family members are important inducers of NSC differentiation . Other factors including sonic hedgehog (Shh) , retinoic acid (RA) , and neuropathiazol  also significantly increase neuronal differentiation of NSCs in vitro. As for the differentiation of NSCs into astrocytes, these factors include leukemia inhibitory factor (LIF), neuropoietin (NP), ciliary neurotrophic factor (CNTF), endothelial growth factor (EGF), and some members of the BMP family [23-25]. Although great advances have been made in elucidating the molecular basis for NSC functions, few drugs have been developed that control NSC fate. Recently, there has been considerable interest in designing new stem cell therapy strategies for promoting brain recovery and repair, that several natural compounds have been proposed . The plant-derived natural compounds that are efficacious in promoting the neuronal differentiation of NS/PCs include protocatechuic acid, wogonin, tenuigenin, salvianolic acid B, baicalin, oleanolic acid, osthole, sulforaphane, claulansine F, tetramethylpyrazine, tanshinone IIA, garcinol, kuwanon V, garcinone D, ferulic acid, quercetin-3-O-glucuronide, epigallocatechin- 3-gallate, curcumin and ginsenoside Rg1 (Table 1). Table 1: The category, source, structure, dose, cell lines and mechanism of 22 natural compounds that benefit for neuronal differentiation of NS/PCs. Protocatechuic acid (PCA) is a phenolic compound isolated from the kernels of Alpinia (A.) oxyphylla. Guan’s study demonstrated that PCA promoted the neuronal differentiation and facilitated survival of phenotypes differentiated from cultured NS/PCs. Moreover, PCA was able to induce neuronal maturation and efficiently promote neurite outgrowth . Wogonin is a flavonoid isolated from Scutellaria baicalensis root. Wogonin induced differentiation and neurite outgrowth of neural precursor cells (NPCs) . Tenuigenin is an aglycone of Polygala tenuifolia Willd. Chen’s results showed that addition of tenuigenin to the NSCs medium increased the number of newly formed neurospheres. More neurons were also obtained when tenuigenin was added in the differentiation medium. Tenuigenin was involved in regulating the proliferation and differentiation of hippocampal NSCs . Salvianolic acid B (SalB) is a potent aqueous phenolic acids of Salvia miltiorrhiza. Guo’s study indicated that SalB is capable of promoting proliferation of neurospheres and differentiation towards the neuronal lineage in vitro. SalB may act in the proliferation of NSCs, and promote NSCs differentiation into neuronal cells. The mRNA for tau, glial fibrillary acidic portein (GFAP) and nestin were presented in differentiating neurospheres induced by SalB. However, highlevel expression of tau mRNA and low-level expression of GFAP mRNA was detected in differentiated cells . Brain derived neurotrophic factor (BDNF) is an important neurotrophic factor that possessed ability to promote neural protection, plasticity, and regeneration in a variety of conditions, such as CNS injury, cerebral ischemia, and electrical stimulation. Zhang’s study suggested that SalB promoted bone marrow-derived NSCs (BMNSCs) proliferation and differentiation towards neuronal lineage (promoted nestin+ BM-NSCs differentiated into greater numbers of NF-M+ neurons and NG2+ oligodendrocyte precursors), protected BM-NSCs from H2O2-induced oxidative stress damage, and induced BDNF production by BM-NSCs, thus offered a possible approach of acilitate the cells survival and differentiation in unfavorable environment . Signal transducer and activator of transcription 3 (stat3) and basic helix-loop-helix (bHLH) gene family are important cellular signal molecules for the regulation of cell fate decision and neuronal differentiation of NS/PCs. Baicalin is a flavonoid isolated from the root of Scutellaria baicalensis G. Baicalin promoted neuronal differentiation of NS/PCs through modulating p-stat3 and bHLH family protein (Hes1, Mash1 and NeuroD1) expression. Baicalin treatment increased the percentages of MAP-2 (microtubule associated protein, mature neuronal marker) positive staining cells and decreased GFAP (glial fibrillary acidic protein, glial marker) staining cells. Meanwhile, baicalin treatment down-regulated the expression of p-stat3 and Hes1, but upregulated the expressions of NeuroD1 and Mash1 . Oleanolic acid (OA) is a naturally occurring triterpenoid found in Ligustrum lucidum. OA significantly inhibited neurosphere formation in a dose-dependent manner and inhibited NSC proliferation. And further study indicated that OA is an effective inducer for NSCs differentiation into neurons by Nkx-2.5- dependent mechanism . The aggregation of β-amyloid (Aβ) into toxic oligomers in the brain is a major pathogenic hallmark of Alzheimer’s disease (AD). Astrocytes, activated by Aβ, appear early in the clinical progression of AD and are especially conspicuous in later disease stages. NSCs can potentially differentiate into astrocytes. The process of NSC differentiation is co-regulated by the Notch, BMP, and JAK/STAT signaling pathways. In particular, the JAK/STAT pathway plays a key role in the transduction of extracellular signals into the nucleus. Furthermore, only once the JAK/ STAT pathway has been activated, can the other two pathways affect the differentiation process. Thus, the JAK/ STAT pathway is the most critical system to regulate the differentiation of NSCs. OA effectively inhibited the Aβ25-35-induced activation of JAK/STAT signaling, with a significant increase in Ngn1 expression and a significant decrease in p-STAT3/STAT3. The results indicated that OA could inhibit the excessive differentiation of NSCs into astrocytes by down-regulating JAK/STAT signaling which might retard the progress of AD . AD is characterized by the deposition of Aβ peptides, which are cleaved from amyloid precursor protein (APP) by β- and γ-secretase. Wnt/β- catenin signaling is implicated in neuronal proliferation, differentiation, and apoptosis. Glycogen synthase kinase (GSK)-3β is a negative modulator of the Wnt signal transduction pathway, contributes to the pathogenesis of AD. Osthole is a coumarin derivative isolated from Cnidium monnieri (L.). Osthole protected APPexpressing NSCs by suppressing the expression of GSK-3β, increasing β-catenin level, and inhibiting neuronal apoptosis. The results demonstrated that osthole enhanced NSC proliferation and differentiation via activation of the Wnt/β-catenin pathway . Sulforaphane (SFN) is a natural organosulfur compound derived from the hydrolysis of the glucosinolate glucoraphanin found in Brassica vegetables. SFN of low concentrations stimulated cell proliferation and prominently increased neurosphere formation and NSC differentiation to neurons. These protective effects were mediated by Wnt signaling pathway, as revealed by the upregulation of β-catenin and cyclin D1 expressions . GSK-3β is also a component of phosphatidylinositol 3-kinase (PI3K)/Akt signaling pathways, which indicates that the phosphorylation of GSK-3β on Ser9 through phosphorylation of Akt could also exert an effect on the stabilization of β-catenin. Claulansine F (Clau F) is a kind of carbazole alkaloid isolated from the stem of Rutaceae Clausena lansium (Lour.) Skeels. Huang’s study suggested that Clau F promoted the neuronal differentiation of NS/PCs through Akt/GSK-3β/β-catenin pathway. Clau F initiated neuronal differentiation with a significant increase of β III-tubulin (TuJ-1)-positive cells and TuJ-1 protein levels. Clau F promoted the maturity and sustainability of neurons by increasing MAP2-positive cells and MAP2 protein levels . The members of the mitogen-activated protein (MAP) kinase family, c-Jun NH2-termianl kinases (JNKs), extracellular signal-related protein kinases (ERKs) and p38 MAP kinases, play an important role in development and differentiation of CNS. Tetramethylpyrazine (TMP) is a biologically active alkaloid isolated from the traditional herbal medicine Ligusticum wallichii Franch. Tian’s study demonstrated that TMP enhanced the proliferation and differentiation of NSCs of rat after hypoxia in vitro, in which the phosphorylation of ERK and p38 was involved . Caveolin-1 (CAV-1), the major functional protein of membrane caveolae, plays critical roles in the endocytosis of exogenous materials. Studies have also found that neurotrophins of nerve growth factor (NGF) and BDNF are important regulators of neuronal survival, differentiation and function. When NGF and BDNF bind to their tyrosine kinase receptor A and B (TrkA and TrkB), they lead to activation of downstream differentiation cascades. Sustained activation of the MAPK (also termed as ERK) and its downstream transcription factors such as cAMP response element-binding protein (CREB) and E-26-like protein 1 (Elk-1) play critical roles in the process of neuronal differentiation. Tanshinone IIA (TIIA) is a major lipophilic diterpene quinone component isolated from Salvia miltiorrhiza Bunge. TIIA activated MAPK42/44 and CREB. TIIA also up-regulated the expressions of BDNF and NGF. CAV-1, which was activated by TIIA, might help TIIA transport across cell membrane to initiate its differentiation effects. In conclusion, TIIA promoted neuronal differentiation partially through MAPK42/44 mediated BDNF and NGF signals in a caveolae-dependent manner . Neurotrophic factors activate the Ras-Raf- MEK [MAPK/ERKK] pathway and, through this pathway, produce cellular neurotrophic actions, including neurite outgrowth, regeneration, and neurogenesis. C/EBPβ, the full-length subtype of C/EBPs, belongs to the basic region in the leucine zipper class of DNAbinding proteins. Pharmacological stimulation of the N-methyl-D-aspartate (NMDA) subtype of the glutamate receptor also leads to the activation of ERK2 in both cortical and hippocampal neurons in culture. NMDA receptor-mediated influx rapidly increases nuclear C/EBPβ and induces excitotoxic death via activation of the calcium-dependent phosphatase, calcineurin. Garcinol is a polyisoprenylated benzophenone derivative found in Garcinia indica fruit rind. Garcinol induced neurite outgrowth in early developing EGF-treated neurospheres and significantly enhanced the expression of MAP-2 and GFAP. Furthermore, the neuronal marker neurofilaments (NF-H) was highly expressed after 5 μM garcinol treatment in NPCs. Garcinol treatment reduced growth factor deprivationmediated cell death and nuclear import of C/ EBPβ levels. Noteworthy, garcinol promoted neurite outgrowth in EGF-responsive NPCs and modulated the ERK pathway in the enhancement of neuronal survival . The mitogens EGF and FGF2, as well as notch activation, play an important role in the maintenance of NSCs by increasing proliferation and inhibiting neuronal differentiation. MicroRNAs (miRNAs) are short noncoding RNAs that simultaneously silence hundreds of target genes. miRNAs are recently discovered to control cell fate determination. Kuwanon V (KWV) is a chalcone-derivative phenolic compound isolated from the root of Morus bombycis. KWV inhibited proliferation, protected and increased neuronal differentiation in rat fetal NSCs, even in the presence of EGF and FGF2. KWV treatment reduced the phosphorylation of extracellular signal-regulated kinase 1/2 (ERK1/2), increased mRNA expression levels of the cyclin-dependent kinase inhibitor p21, reduced notch1 and hes1 transcription and up-regulated the miRNAs including miR-9, miR-29a and miR-181a. The findings indicated that KWV is able to modulate NSC fate into neurons . STAT3, an important transcription factor, is known to be activated through phosphorylation in response to various cytokines and growth factors, and is reported to play important roles in early embryonic development, cell proliferation, apoptosis and inflammation. It was reported that STAT3 can directly regulate the transcription of Cyclin D1 gene due to STAT binding recognition sites in its promoter, thus STAT3 activation results in increased protein expression of Cyclin D1. Nrf2 is a master regulator of cellular redox homeostasis and belongs to the subfamily of basic leucine zipper transcription factors. However, increasing studies have shown the vital effects of Nrf2 on stem cell proliferation and differentiation . Garcinon D is a natural xanthone isolated from Garcinia mangostana L. Garcinone D can promote the proliferation of C17.2 neural progenitor cells and enhance the percentage of cells in S phase, which may be due to the involvement of STAT3/Cyclin D1 pathway and Nrf2/HO-1 pathway . Ferulaic acid (FA) is a major component of traditional Chinese herbal medicine for activating blood circulation and relieving stagnation, such as Radix Angelicae Sinensis, Rhizoma Chuanxiong. FA significantly increased the proliferation of NSC/NPCs cultured from the telencephalon of embryonic day-14 rats, and increased the number and size of secondary formed neurospheres. An in vitro differentiation assay showed that FA did not affect the percentage of either Tuj-1-positive cells or GFAP-positive cells in the total cell population . During neurogenesis, NSCs or NPCs that generate neurons and glia migrate from germinal zones where they are born to their final destination to differentiate and ultimately be integrated into neuronal circuits. Stromal cell-derived factor 1 (SDF-1) and chemokine (C-XC motif) receptor 4 (CXCR4) are the most widely expressed during the development of the embryo and essential for the migration of a variety of neuronal cell populations in the rodent brain . Tetramethylpyrazine (TMP) promoted NPC migration both in vitro and in vivo through increasing the expression and secretion of SDF- 1, a chemokine that direct NPC cell trafficking. It might be associated with the activation of the PI3K pathways. And the role of TMP in NPC migration could be inhibited by AMD3100, CXCR4 antagonist . Quercetin is a widely distributed natural flavonoid found in many vegetables and fruits including grapes, apples and berries. Quercetin-3-O-glucuronide (Q3GA) is one of the major metabolites. Baral’s study demonstrated that Q3GA increased NSC proliferation via the Akt/cyclin D1 and BDNF signaling pathway and promoted migration (increased mRNA expression of CXCR4) in vitro and in vivo. In contrast, quercetin induced apoptosis of NSCs, along with Akt dephosphorylation . Preclinical studies suggest that natural compounds modulate neuroplasticity. A particular example of neuroplasticity is the generation of new neurons in the hippocampus (adult hippocampal neurogenesis) and a growing number of studies have begun to address the question of how nutrition and natural compounds might affect adult neurogenesis . Epigallo-catechin-3- gallate (EGCG) is a flavonoid found in the leaves of Camellia sinensis (green tea). EGCG increased neuronal survival in adult hippocampal neurogenesis in vivo and in vitro . Curcumin is a natural phenolic component isolated from the rhizomes of the plant Curcuma longa Linn (turmeric). Curcumin stimulated the proliferation of embryonic cortical neural stem cells and neurogenesis in the adult hippocampus via the ERK- and p38 MAP kinase pathways . Embryonic stem (ES) cells, characterized by self-renewal, immortality and pluripotency, are one of the major sources of stem cells . Glucocorticoid receptor (GR) expresses in almost every cell in the body and regulates genes controlling the development, metabolism, and immune response . MAPK signaling pathways have been associated with the regulation of neuronal cell proliferation, differentiation and neurite outgrowth. On the other side, PI3K-Akt pathway is reported to be indispensable in moto-neuron specification from human NSCs, and in some cases, this pathway may have some interaction with MAPK signaling. Ginsenoside Rg1 is a steroidal saponin of ginseng. Wu’s study showed that more than 80% of Rg1-treated embryoid bodies (EBs) differentiated into neuron-like cells and the protein expression of neurofilament and β-tubulin III was gradually increased. Rg1 possessed the effects on inducing differentiation of ES cells into neurons in vitro via the GRMEK- ERK1/2-PI3K-Akt signaling pathway . Mesenchymal stem cells (MSCs) are classically defined as multipotent cells, which can differentiate into diverse cell types, including bone, cartilage, fat, tendon, muscle, and marrow stroma , and can be obtained from many sources, such as bone, tendon, skin, adipose tissue, umbilical cord, blood, and amnion . In addition, MSCs are poorly immunogenic . MSCs should be plastic adherent, have fibroblast-like morphology, express stromal markers CD73, CD90, and CD105, and be negative for the hematopoietic markers CD14, CD34, and CD45 . Each specific differentiation type of MSCderived cell types is dynamically controlled by several specific signal transductions conveyed by cytokines, growth factors, and extracellular matrix molecules . Different transcription factors can regulate differentiation into multiple lineages. Some studies have explored the integration of transcription factors into the differentiation of MSCs, including Run related transcription factor (Runx)2 and SRYrelated high mobility group-box gene 9 (Sox9) for osteogenic and chondrocyte differentiation, and peroxisome proliferators activated receptor (PPAR)γ for adipocyte differentiation . Recent studies have shown that MSCs can also differentiate into neuron-like cells . There is an increasing interest in the use of MSCs in regenerative medicine for neurodegenerative diseases . However, most of the engrafted cells die within a week after transplantation and only a few cells successfully differentiate into neurons and are engrafted into injured tissues, which severely limits the efficacy of the therapy . Thus, the rate of differentiation prior to application in cell therapy needs to be improved. Methods for obtaining neuronal cells from MSCs involved culture with factors specifically involved in neural development, including growth factors, neurotrophins and cytokines or specific chemical compounds such as retinoic acid (RA), β-mercaptoethanol, dimethyl sulfoxide and butylated hydroxyanizole . Chemical induction has two advantages over factor induction: chemically induced BMSCs more quickly acquire morphological features and express specific markers of mature neuronal cells, and the process produces a larger amount of differentiated neuronal cells . Despite much progress in identifying factors and mechanisms that direct and control neuronal differentiation of MSCs, the therapeutic potential of MSCs is still limited by the lack of effective ways to accurately control MSCs to differentiate into neuronal cells both in vitro and in vivo due to the ambiguity of the mechanisms underneath. Thus, finding more factors for chemical induction is important for investigating the mechanisms of neuronal differentiation and for methods of clinical therapy. The plant-derived natural compounds that benefit for inducing neuronal differentiation of MSCs include salidroside, resveratrol, tetramethylpyrazine, safrole oxide and sodium ferulate (Table 2). Table 2: The category, source, structure, dose, cell lines and mechanism of 6 natural compounds that benefit for neuronal differentiation of MSCs. BMP signaling pathway plays an important role in the regulation of stem cell behavior . The activation of Notch signaling pathway in neural crest cells induced the irreversible switches from neuro to glio-genesis . Salidroside (p-hydroxyphenethyl-β-D-glucoside, SAL) is a phenylpropanoid glycoside isolated from Rhodiola rosea L. SAL inhibited the proliferation, induced neuronal phenotypes, and upregulated the expressions of neuronal-specific marker molecules, such as neuronal enolase 2 (Eno2/ NSE), MAP-2, and beta 3 class III tubulin (Tubb3/β-tubulin III) in mouse MSCs D1 cells. SAL not only downregulated the expressions of Notch1 and hairy enhancer of split 1 (Drosophila) (Hes1) but also upregulated the expression of Smad1/5/8 and its phosphorylation (p-Smad 1/5/8). Therefore, the neuronal differentiation effects of SAL on D1 cells were mediated by down-regulation of Notch signaling and up-regulation of BMP signaling pathways . In addition, Zhao’s study demonstrated that SAL can induce rMSCs to differentiate into dopaminergic neurons. The expression of dopamine neurons markers, such as dopaminebeta- hydroxy (DBH), dopa decarboxylase (DDC) and tyrosine hydroxylase (TH), was significantly upregulated after treatment with SAL for 1-12 days. It also increased the expression of BDNF, neurotrophin-3 (NT-3) and NGF mRNAs, and promoted the secretion of these growth factors . Sirtuin 1 (SIRT1) activation plays a pivotal role in neurodegenerative diseases and brain senescence because its neuroprotective effects correlated with its functions in metabolism, stress resistance, and genomic stability . Resveratrol (RSV) is a natural non-flavonoid polyphenol compound obtained from various plants, including grapes, peanuts, pine trees, and cassia. Resveratrol treatment, along with the use of neuronal induction media, effectively stimulated neuronal cell differentiation of human bone marrow mesenchymal stem cells (hBMMSCs). The number and neurite length of RSVdMSCs were significantly increased compared to differentiated MSCs (dMSCs). The RSVdMSCs and dMSCs had significantly increased expression of the neuronal-specific marker genes Nestin, Musashi, CD133, GFAP, NF-M, MAP- 2, and KCNH1. And this effect was abolished by the treatment of SIRT1 inhibitor EX527. Thus resveratrol-induced SIRT1 activation promoted neuronal differentiation of hBM-MSCs . Furthermore, S Jahan’s study reported that protein kinase A (PKA)-GSK3β and β-catenin signaling played a critical role in trans-resveratrol mediated neuronal differentiation in human cord blood stem cells (hCBMSCs) . It was reported that Wnt signaling is the leading pathway for neuronal induction in MSCs  and stem cells generally follow the Wnt signaling pathway for cell growth, development, and survival. In Wnt signaling, β-catenin plays a significant role in the induction of neuronal differentiation . β-catenin is regulated by upstream molecules like glycogen synthase kinase 3 beta (GSK3β). GSK3β phosphorylates β-catenin thus directing β-catenin towards ubiquitination and subsequently inhibiting neuronal differentiation . cAMP is a secondary messenger which modulates the function of PKA. cAMP-dependent PKA activation leads to growth of neuronal extensions and creates new synaptic connections . PKA further regulates the downstream molecules for progressive neurogenesis. The present study with pharmacological inhibitors also confirmed that PKA significantly induces β-catenin expression via GSK3β induction and stimulates CREB phosphorylation and pERK1/2 induction. Nan’s results demonstrated that TMP induced human umbilical cord-derived mesenchymal stem cells (hUMSCs) to differentiate into neuron-like cells effectively with the optimal concentration of 4.67 mg/mL. After induction, the NSE and NF-H of the neuron-like cells were positive, but the GFAP-2 was negative . Heat shock protein 70 (Hsp70) is an important factor in neuronal differentiation . Safrole oxide (SFO) could effectively induce BMSC neural differentiation in the presence of serum and fibroblast growth factor 2 (FGF 2) and did not affect cell viability at low concentrations. The levels of neuron-specific enolase (NSE) and neurofilament-L (NF-L) were increased greatly with SFO treatment. Furthermore, SFO increased the level of Hsp70. Knockdown of Hsp70 by its small interfering RNA blocked SFO-induced BMSC differentiation. Thus, SFO induced neuronal differentiation of rBMSC by elevating Hsp70 . Sodium ferulate (SF) exhibits a variety of biological functions, including clearing free radicals, anti-lipid oxidation, anti-platelet aggregation. Studies had suggested that SF can induce human marrow stromal cells (hMSCs) to differentiate into neural-like cells in vitro. The cells express neural proteins, such as nestin, NSE and GFAP . Neurite outgrowth is an indispensable step for functional networks of neurons during their differentiation; and is thus, known to be a typical marker of neuronal differentiation. The functional neurites are generated through a complex process involving three stages: (1) initiation of neurite formation; (2) elongation of neurites to meet the appropriate targets; and (3) synapse formation and functional maturation of the newly formed neuronal networks . Many structural and signaling proteins are involved in modulating such a complex differentiation process. Regulation of neurite outgrowth is important in developing therapies to promote neuronal regeneration from nerve injury or neurological disorders . Thus, drug discovery and development with neurite outgrowth promoting activity and understanding of molecular mechanisms for the regulation of neurite outgrowth will make possible for the development of effective treatments for axonal and synaptic damages [82,83]. Neurotrophic factors, such as NGF, BDNF and neurotrophins, are a family of secreted proteins that play vital roles in promoting neural growth and survival during development, and are crucial for maintaining the integrity of neurons throughout an individual’s entire lifetime . Neurotrophins including NGF regulate neuronal survival, growth and differentiation through multiple mechanisms, especially, Raf/ MEK/ERK and PI3K/Akt pathways . Sustained activation of ERK1/2 is essential to support the actions of NGF on neurite extension . It is now known that the ERK1/2 pathway governs two dispensable processes: transcriptioninvolving latency process and neurite extension process . In the transcription-involving latency process, neurotrophic factors activate ERK1/2 pathway and modulate the transcription of various genes for the initiation and elongation of neurites. On the other hand, in the neurite extension process, the activation of ERK1/2 and PI3K/Akt pathways triggers the extension of neurites, whereas gene transcription is no longer required for neurite outgrowth. However, therapeutic application of neurotrophic factors is severely restricted by their poor penetration of the blood-brain barrier (BBB) and undesirable apoptotic effect through interaction with the p75NTR receptor . Thus, there remains the need for identification of small molecules that are safe, nontoxic, and can mimic the neurotrophic action as an alternative therapy approach. Encouragingly, many small molecules are known to induce the activation of ERK1/2 and PI3K/Akt pathways and promote neurite outgrowth . And many natural products are highly active neuroprotective and neuritogenic agents for promoting neuronal differentiation and maturation or potentiating the actions of NGF with low cost and few side effects . The medical plant-derived natural compounds, including Cpd 1, emodin, lactucopicrin, puerarin, asarone, curcuminoids, claulansine F, lindersin B, geniposide and tetramethylpyrazine, exert neurotrophic effects by inducing neuronal differentiation and promoting neurite outgrowth of PC12 cells, Neuro2a cells and SH-SY5Y cells (Table 3). Neuro2a cell is a mouse neural crest-derived cell line that has been extensively used to study neuronal differentiation and neurite growth . Both MEK-ERK and PI3K-Akt pathways play crucial roles in neuronal differentiation and neurite outgrowth of embryonic and adult progenitor cells. 7-(4-hydroxyphenyl)-1-phenyl- 4E-hepten-3-one (Cpd 1) is a diarylheptanoid isolated from the rhizomes of Alpinia (A.) officinarum.. Cpd 1 induced differentiation of neuroblastoma Neuro-2a cells into a neuron-like morphology, and accelerated the establishment of axon-dendrite polarization of cultured hippocampal neurons. Cpd 1 also promoted neurite extension in both Neuro-2a cells and neurons. And further study showed that the effects of Cpd 1 on neuronal differentiation and neurite growth were specifically dependent on the activation of ERKs and PI3K-Akt signaling pathways . GSK-3β, a key downstream effector of Akt in neurite development, plays a critical role in establishing neuronal polarity into axons and dendrites during neuronal differentiation . And it is well established that the CREB plays crucial roles in neuronal differentiation and development and is involved in neurite outgrowth . Emodin is an anthraquinones compound isolated from the root of P. multiflorum Thunb. Park’s study showed that Emodin-induced neurite outgrowth is associated with PI3K/Akt/GSK-3β signaling pathway in Neuro2a cells. Emodin also promoted PI3K/Akt-dependent CREB phosphorylation . Lactucopicrin is a sesquiterpene lactone constitute found in Cichorium intybus L. Lactucopicrin increased intracellular Ca2+ levels with a substantial rise in CHRM1 expression in Neuro2a cells. Moreover, lactucopicrin actively promoted neurite outgrowth via Ca2+-mediated activation of Ca2+/CaMKII. It further activated ATF1 along with modulating the levels of TrkA, ERK 1/2, AKT, and synaptophysin 1 in Neuro2a cells. Therefore, Lactucopicrin potentiated neuritogenesis and neurotrophic effects by regulating Ca2+/CaMKII/ATF1 signaling pathway . The rat adrenal pheochromocytoma PC12 cells are widely used as a model neuronal cell line for the study of neurodegenerative diseases, because the behaviors of the cells are similar to neural progenitor cells. Moreover, PC12 cells have many advantages over primary cultured neuronal cells, such as the cell population has good homology and can be obtained easily . Puerarin is a C-glucosylated isoflavone derived from the dried root of Pueraria lobata (Wild.) Ohwi. Zhao’s study demonstrated that puerarin potentiated the effect of NGF on neuritogenesis in PC12 cells by >10-fold. And puerarin effectively coordinated with NGF to stimulate neuritogenesis via activating ERK1/2 and PI3K/Akt pathways in neurite extension process. Moreover, the activation of ERK1/2 and PI3K/Akt pathways induced the nuclear translocation of transcriptional factor Nrf2 and subsequent HO-1 expression . NGF is one of the key modulators of neurite outgrowth during development, and indeed many neurodegenerative diseases are associated with NGF insufficiency . NGF achieves its function by binding and activating tyrosine kinase A (TrkA) receptor on neuronal cells. The NGF-activated TrkA stimulates downstream signaling pathways, which results in neuronal differentiation and promoting cell survival . The major active components of Acori Tatarinowii Rhizoma (ATR) are volatile oils, and indeed α-asarone and β-asarone are accounting about 95% of total ATR oil. Application of α-asarone or β-asarone, potentiated NGF-induced neurite outgrowth and stimulated the expression of neurofilaments in PC12 cells. In addition, α-asarone and β-asarone showed synergistic effects in the potentiation of NGF-induced neuronal differentiation, which was mediated by a cAMPPKA signaling . It has been reported that NGF interacts with TrkA and leads to neurite outgrowth and neuronal differentiation through phosphorylation of ERKs in PC12 cells. Several signaling pathways, including ERK and protein kinase C (PKC), have been associated with regulation of denovo protein synthesis in the context of LTP (long-term, synaptic plasticity and memory) and converge on the phosphorylation of CREB at Ser133. Phosphorylated CREB protein recruits the transcriptional activator CREB binding protein (CBP) to stimulate transcription of CREregulated genes involved in the neurogenesis, neuritogenesis, and cognition function . Growth-associated protein-43 (GAP-43) and neurofilament-L (NF-L) are neuron-specific proteins which exhibit elevated synthesis and axonal fast-transport during nerve regeneration and serve as useful indicators of PC12 cell differentiation . Curcuminoids, the predominant polyphenolic compounds in the rhizome of Curcuma longa Linn., consist of curcumin, demethoxycurcumin (DMC), and bisdemethoxycurcumin (BDMC). Liao’s study demonstrated that curcumin, DMC, and BDMC promoted neurite outgrowth in PC12 cells through MAPK/ERK- and PKC-dependent pathways. They increased GAP-43 and NF-L expression, moreover, activation of CREB coupling with CRE-dependent gene transcription may play a vital role for curcumin- or DMCinduced PC12 differentiation . The binding of NGF to high-affinity TrkA receptors mainly triggers two cellular signaling cascades: the MAPK-ERK and PI3K-AKT pathways . After binding to phosphotyrosine-containing recognition elements of TrkA receptors, signal molecules of the MAPK and PI3K pathways are phosphorylated and thus activated. The activation of PI3K pathways thus triggers gene transcription and regulation of the cytoskeletal machinery. In these differentiation conditions, sustained activation of the MAPK-ERK pathway and its downstream transcription factor CREB has an essential role in cellular transduction . Moreover, the acetylation of p53, which is triggered by PI3K-AKT, has also been implicated in the regulation of axonal outgrowth . Claulansine F (Clau F) is a carbazole alkaloid isolated from the stem of Clausena lansium (Lour) Skeels. Clau F exerted a neurotrophinlike effect. Clau F significantly increased neuritogenesis and GAP-43 expression in PC12 cells specifically via activation of the ERK signaling pathway . Lindersin B is a new cucurbitane triterpenoid compound isolated from Lindernia crustacean. Lindersin B induced neurite outgrowth in PC12 cells by activation of TrkA/PI3K/ERK signaling pathway . The reggie proteins were described to function as vital regulators of the cell-intrinsic program which was associated with axon growth and regeneration of neurons . Lu’s study also demonstrated that curcumin promoted neurite outgrowth via reggie-1 and ERK1/2 pathway in cortical neurons . Geniposide is an iridoid compound isolated from Gardenia jasminoides. Geniposide, an agonist for glucagon-like peptide- 1(GLP-1) receptor, induced neuronal differentiation of PC12 cells accompanied with neurite outgrowth and increased the expression of GAP-43 . Topoisomerase IIβ (TopoIIβ) is a nuclear enzyme with an essential role in neuronal development and axon guidance . The transcription of the TopoIIβ gene is regulated mainly by a region between −553 and −481 relative to the transcription start site, with binding sites for specif﻿﻿icity protein 1 (Sp1) and nuclear factor Y (NF-Y) on the gene promoter . Sp1 and NF-Y have been identified as an important downstream mediator in the ERK 1/2 and Akt-dependent signaling cascades that contribute to regulate certain cellular gene [115,116]. Tetramethylpyrazine (TMP) is a biologically active alkaloid isolated from Ligusticum wallichii Franch. SH-SY5Y cells treated with TMP (80 μM) terminally differentiated into neurons, characterized by increased neuronal markers (tubulin β III, MAP2), and increased neurite outgrowth. Further study showed that TMP induced SHSY5Y cell differentiation toward the neuronal phenotype as a result of up-regulation of TopoIIβ via the PI3K/Akt/Sp1 pathway [117,118]. The phenomenon of adult neurogenesis provides a light for the nervous system injuries. Agents that can protect neurons or increase neurogenesis, both in vitro and in vivo, hold promise for the treatment of nervous system disorders. Natural compounds and their potential effect on neuroprotection and neuroplasticity are of great interest to both the general public and scientists. A growing number of studies have begun to address the question of how nutrition and natural compounds might affect adult neurogenesis. Currently, numerous naturally occurring compounds have been shown to play a role in the biological processes of neuronal differentiation and neurite outgrowth, and that raises the possibility of regeneration of neurons or reconstruction of synaptic networks in neurological disorders. Neuronal differentiation is a complex process because it can occur in different cell types and be caused by a variety of inducers and involving the coordinated activity of numerous signaling pathways. In this study (Figure 1), we summarized the detailed research progress on the natural active compounds with potential neurotrophic effects and their molecular mechanisms on inducing neuronal differentiation in NS/PCs, MSCs, PC12 cells and neuroblastoma cells. The natural plant active component include phenolics, flavonoids, alkaloids, coumarins, terpenes, quinines, glycosides, iridoids, volatile oils and others (xanthone, isothiocyanate). And the above natural products exert their promotion effects via regulating many factors involve in the process of neurogenesis, including specific proteins (β III-tubulin, MAP-2, NSE, tau, nestin, GAP-43, neurofilaments, GFAP), related genes and proteins (Stat3, Hes1, Mash1, NeuroD1, SIRT1, Hsp70, Reggie-1, Cyclin D1), transcription factors (CREB, Nkx-2.5, Ngn1), neurotrophins (BDNF, NGF, NT-3) and signaling pathways (JAK/STAT, Wnt/β-catenin, MEK-ERK1/2, PI3K/Akt, Akt/GSK-3β/β-catenin, PKA/ GSK3β/β-catenin, Notch, BMP, Ca2+/CaMKII/ ATF1, Nrf2/HO-1). According to the literatures we’ve retrieved, the natural compounds claulansine F, tetramethylpyrazine and curcumin that work in more than one cell model (NSCs, MSCs or neural cell lines). Among them, claulansine F works in NS/PCs and PC12 cells, tetramethylpyrazine works in NS/PCs, hUMSCs, and SHSY5Y neuroblastoma cells, curcumin works in C17.2 NPC and PC12 cells. The development of neuro-modulating natural products is of great value for the prevention or treatment of nervous system diseases and for neuronal regenerative medicine. With more and more attention focused on the disease-modifying natural compounds, the neurogenesis and neuroprotective effects of natural products have become increasingly prominent. However, the efficient delivery of compounds to the brain remains a major challenge in the discovery and development of new drugs for the treatment of CNS diseases . The blood brain barrier (BBB) is the major barrier to restrict the delivery of compounds into the CNS . The BBB is the network of capillaries that controls the passage of substances from the blood into the brain and other parts of the CNS. Compared with peripheral capillaries that are permeable to small molecules (sometimes even to large molecules, such as proteins), the BBB more strictly limits the penetration of nearly all exogenous chemicals into the brain by physical and metabolic mechanisms . It has been reported that almost all macromolecule drugs and over 98% of small molecule drugs could not pass the BBB . As this barrier is the major obstacle for drug delivery into CNS, a credible BBB model is very necessary to assess the BBB permeability of novel neuroactive compounds including bioactive compounds which have been extracted from medicinal plants and have the potential for the treatment of CNS diseases. BBB permeability should be taken as a key factor in neuroprotective drug discovery . And new developments will be achieved in the fields of natural products on modulating neurogenesis by combining the research of neuronal differentiation-related genes, proteins and signaling pathways. It is desirable to have more beneficial natural products with the effects of neuroplasticity and neuroprotection, which would create a new alternative for prevention and treatment neurobiological disorders. Bjorklund A, Lindvall O. Cell replacement therapies for central nervous system disorders. Nat. Neurosci 3(1), 537-544 (2000). Eriksson PS, Perfilieva E, Björk-Eriksson T, et al. Neurogenesis in the adult human hippocampus. Nature. Medicine 4(1), 1313-1317 (1998). Jun H, Hussaini SMQ, Rigby MJ, et al. Functional role of adult hippocampal neurogenesis as a therapeutic strategy for mental disorders. Neural. Plast 2012(1), 854285 (2012). N G, P V. Mechanisms of neural specification from embryonic stem cells. Curr. Opin. Neurobiol 20(1), 37-43 (2010). Christie KJ, Turnley AM. Regulation of endogenous neural stem/progenitor cells for neural repair-factors that promote neurogenesis and gliogenesis in the normal and damaged brain. Front. Cell. Neurosci 6(1), 70-87 (2013). Yu IT, Park J-Y, Kim SH, et al. Valproic acid promotes neuronal differentiation by induction of proneural factors in association with H4 acetylation. Neuropharmacology 56(1), 473-480 (2009). Lim JY, Park SI, Oh JH, et al. Brain-derived neurotrophic factor stimulates the neural differentiation of human umbilical cord blood-derived mesenchymal stem cells and survival of differentiated cells through MAPK/ERK andPI3K/Akt-dependent signaling pathways. J. Neurosci. Res 86(1), 2168-2178 (2008). Xu J, Lacoske MH, Theodorakis EA. Neurotrophic natural products: chemistry and biology. Angew Chem. Int. Ed. Engl 53(1), 956-987 (2014). GL M, H S. Adult neurogenesis in the mammalianbrain: significant answers and significant questions. Neuron 70(1), 687-702 (2011). Ming G, Song H. Adult neurogenesis in the mammalian brain: significant answers and significant questions. Neuron 70(1), 687-702 (2011). A AB, JM GV, AD T. A unified hypothesis on the lineage of neural stem cells. Nat. Rev. Neurosci 2(1), 287-293 (2001). Drapeau E, Abrous DN. Stem Cell Review Series: Role of neurogenesis in age-related memory disorders. Aging. Cell 7(1), 569-589 (2008). Magnus T, Rao MS. Neural stem cells in inflammatory CNS diseases: mechanisms and therapy. J. Cell Mol. Med 9(1), 303-319 (2005). Yang J, Jiang Z, Fitzgerald DC, et al. Adult neural stem cells expressing IL-10 confer potent immunomodulation and remyelination in experimental autoimmune encephalitis. J. Clin. Invest 119(1), 3678-3691 (2009). Young TH, Hung CH. Behavior of embryonic rat cerebral cortical stem cells on the PVA and EVAL substrates. Biomaterials 26(1), 4291–4299 26, 4291-4299 (2005). Yoon K, Gaiano N. Notch signaling in the mammalian central nervous system: insights from mouse mutants. Nat. Neurosci 8(1), 709-715 (2005). Bonaguidi MA, Peng C-Y, McGuire T, et al. Noggin expands neural stem cells in the adult hippocampus. J. Neurosci 28(1), 9194-9204 (2008). Hamby ME, Coskun V, Sun YE. Transcriptional regulation of neuronal differentiation: the epigenetic layer of complexity. Biochim. Biophys. Acta 1779(1), 432-437 (2008). Bath KG, Lee FS. Neurotrophic factor control of adult SVZ neurogenesis. Dev. Neurobiol 70(1), 339-349 (2010). Li XJ, Zhang X, Johnson MA, et al. Coordination of sonic hedgehog and Wnt signaling determines ventral and dorsal telencephalic neuron types fromhuman embryonic stem cells. Development 136(1), 4055-4063 (2009). Song H-j, Stevens CF, Gage FH. Neural stem cells from adult hippocampus develop essential properties of functional CNS neurons. Nat. Neurosci 5(1), 438-445 (2002). Warashina M, Min KH, Kuwabara T, et al. A synthetic small molecule that induces neuronal differentiation of adult hippocampal neural progenitor cells. Angew. Chem. Int. Ed. Engl 45(1), 591-593 (2006). Bonaguidi MA, McGuire T, Hu M, et al. LIF and BMP signaling generate separate and discrete types of GFAP-expressing cells. Development 132(1), 5503-5514 (2005). Ohno M, Kohyama J, Namihira M, et al. Neuropoietin induces neuroepithelial cells to differentiate into astrocytes via activation of STAT3. Cytokine 36(1), 17-22 (2006). Rajan P, McKay RDG. Multiple routes to astrocytic differentiation in the CNS. J. Neurosci 18(1), 3620-3629 (1998). Pieper AA, Xie S, Capota E, et al. Discovery of a proneurogenic, neuroprotective chemical. Cell 142(1), 39–51 142, 39-51 (2010). Guan S, Zhang X-L, Ge D, et al. Protocatechuic acid promotes the neuronal differentiation and facilitates survival of phenotypes differentiated from cultured neural stem and progenitor cells. Eur. J. Pharmacol 670(1), 471-478 (2011). Lim JS, Yoo M, Kwon HJ, et al. Wogonin induces differentiation and neurite outgrowth of neural precursor cells. Biochem. Biophys. Research. Commun 402(1), 42-47 (2010). Chen Y, Huang X, Chen W, et al. Tenuigenin promotes proliferation and differentiation of hippocampal neural stem cells. Neurochem. Research 37(1), 771-777 (2012). Guo G, LI B, Wang Y, et al. Effects of salvianolic acid B on proliferation, neurite outgrowth and differentiation of neural stem cells derived from the cerebral cortex of embryonic mice. Sci. China. Life. Sci 53(1), 653-662 (2010). Zhang N, Kang T, Xia Y, et al. Effects of salvianolic acid B on survival, self-renewal and neuronal differentiation of bone marrow derived neural stem cells. Eur. J. Pharmacol 697(1), 32-39 (2012). Li Y, Zhuang P, Shen B, et al. Baicalin promotes neuronal differentiation of neural stem progenitor cells through modulating p-stat3 and bHLH family protein expression. Brain. Res 1429(1), 36-42 (2012). Ning Y, Huang J, Kalionis B, et al. Oleanolic Acid Induces Differentiation of Neural Stem Cells to Neurons: An Involvement of Transcription Factor Nkx-2.5. Stem. Cells. Int 2015(1), 672312-672324 (2015). Zhang YL, Zhou Z, Han WW, et al. Oleanolic acid inhibiting the differentiation of neural stem cells into astrocyte by down-regulating JAK/STAT signaling pathway. American. J. Chin. Med 44(1), 103-117 (2016). Yao Y, Gao Z, Liang W, et al. Osthole promotes neuronal differentiation and inhibits apoptosis via Wnt/β-catenin signaling in an Alzheimer's disease model. Toxicol. App. Pharmacol 289(1), 474-481 (2015). Han Z, Xu Q, Li C, et al. Effects of sulforaphane on neural stem cell proliferation and differentiation. Genesis 55(1), (2017). Huang J, Ma Y, Yuan Y, et al. Claulansine F promoted the neuronal differentiation of neural stem and progenitor cells through Akt/GSK-3β/β-catenin pathway. Eur. J. Pharmacol 786(1), 72-84 (2016). Tian Y, Liu Y, Chen X, et al. Tetramethylpyrazine promotes proliferation and differentiation of neural stem cells from rat brain in hypoxic condition via mitogen-activated protein kinases pathway in vitro. Neurosci. Lett 474(1), 26-31 (2010). Zhao Y, Xu P, Hu S, et al. Tanshinone IIA, a multiple target neuroprotectant, promotes caveolae-dependent neuronal differentiation. Eur. J. Pharmacol 765(1), 437-446 (2015). Weng M, Liao C, Yu S, et al. Garcinol promotes neurogenesis in rat cortical progenitor cells through the duration of extracellular signal-regulated kinase signaling. J. Agric. Food. Chem 59(1), 1031-1040 (2011). Kong S-Y, Park M-H, Lee M, et al. Kuwanon V inhibits proliferation, promotes cell survival and increases neurogenesis of neural stem cells. PLoS. One 10(1), e0118188 (2015). Murakami S, Motohashi H. Roles of NRF2 in cell proliferation and differentiation. Free. Radic. Biol. Med 88(1), 209-212 (2015). Yang X, ShengnanWang, Ouyang Y, et al. Garcinone D, a natural xanthone promotes C17.2 neural stem cell proliferation: possible involvement of STAT3/Cyclin D1 pathway and Nrf2/HO-1 pathway. Neurosci. Lett 626(1), 6-12 (2016). T Y, H H, N H, et al. Ferulic acid induces neural progenitor cell proliferation in vitro and in vivo. Neuroscience 165, 515-524 (2010). L X, J W, W W, et al. The effect of stromal cell-derived factor 1 in the migration of neural stem cells. Cell. Biochem. Biophys 70(1), 1609-1616 (2014). Kong X, Zhong M, Su X, et al. Tetramethylpyrazine promotes migration of neural precursor cells via activating the phosphatidylinositol 3-kinase pathway. Mol. Neurobiol 53(1), 6526-6539 (2016). Baral S, Pariyar R, Kim J, et al. Quercetin-3-O-glucuronide promotes the proliferation and migration of neural stem cells. Neurobiol. Aging (2016). MS Z, S T. Nutrition, adult hippocampal neurogenesis and mental health. Br. Med. Bull 103(1), 89-114 (2012). Pez lo L, Rquez V, Nchez S, et al. Green tea compound epigallo-catechin-3-gallate (EGCG) increases neuronal survival in adult hippocampal neurogenesis in vivo and in vitro. Neuroscience 322(1), 208-220 (2016). Kim SJ, Son TG, Park HR, et al. Curcumin stimulates proliferation of embryonic neural progenitor cells and neurogenesis in the adult hippocampus. J. Biol. Chem 283(1), 14497-14505 (2008). Brignier AC, Gewirtz AM. Embryonic and adult stem cell therapy. J. Allergy Clin. Immunol 125(1), S336–S344 (2010). Lu NZ, Wardell SE, Burnstein KL, et al. International Union of Pharmacology. LXV. The pharmacology and classification of the nuclear receptor superfamily: glucocorticoid, mineralocorticoid, progesterone, and androgen receptors. Pharmacol. Rev 58(1), 782-797 (2006). Wu J, Pan Z, Cheng M, et al. Ginsenoside Rg1 facilitates neural differentiation of mouse embryonic stem cells via GR-dependent signaling pathway. Neurochem. Int 62(1), 92-102 (2013). Pittenger MF, Mackay AM, Beck SC, et al. Multilineage potential of adult human mesenchymal stem cells. Science 284(1), 143-147 (1999). Ridge SM, Francis J. Sullivan, Glynn SA. Mesenchymal stem cells: key players in cancer progression. Mol Cancer 16(1), 31 (2017). Mora C, Serzanti M, Consiglio A, et al. Clinical potentials of human pluripotent stem cells. Cell. Biol. Toxicol 33(1), 351-360 (2017). Dominici M, Blanc KL, Mueller I, et al. Minimal criteria for defining multipotent mesenchymal stromal cells. The International Society for Cellular Therapy position statement. Cytotherapy 8(1), 315-317 (2006). Flajollet S, Tian TV, Huot L, et al. Increased adipogenesis in cultured embryonic chondrocytes and in adult bone marrow of dominant negative Erg transgenic mice. PLoS. One 7(1), e48656 (2012). Almalki SG, Agrawal DK. Key transcription factors in the differentiation of mesenchymal stem cells. Differentiation 92(1), 41-51 (2016). Jeong SG, Ohn T, Kim SH, et al. Valproic acid promotes neuronal differentiation by induction of neuroprogenitors in human bone-marrow mesenchymal stromal cells. Neurosci. Lett 554(1), 22-27 (2013). Dantuma E, Merchant S, Sugaya K. Stem cells for the treatment of neurodegenerative diseases. Stem Cell Res. Ther 1(1), 37-43 (2010). Fan W, Cheng K, Qin X, et al. mTORC1 and mTORC2 play different roles in the functional survival of transplanted adipose-derived stromal cells in hind limb ischemic mice via regulating in flammation in vivo. Stem Cells 31(1), 203-214 (2013). Sanchez-Ramos J, Song S, Cardozo-Pelaez F, et al. Adult bone marrow stromal cells differentiate into neural cells in vitro. Exp. Neurol 164(1), 247-256 (2000). Muñoz-Elías G, Woodbury D, Black IB. Marrow stromal cells, mitosis, and neuronal differentiation: stem cell and precursor functions. Stem. Cells 21(1), 437-448 (2003). Sieber C, Kopf J, Hiepen C, et al. Recent advances in BMP receptor signaling. Cytok. Growth. Fac. Rev 20(1), 343-355 (2009). Artavanis-Tsakonas S, Rand MD, Lake RJ. Notch signaling: cell fate control and signal integration in development. Science 284(1), 770-776 (1999). Zhao HB, Qi SN, Dong JZ, et al. Salidroside induces neuronal differentiation of mouse mesenchymal stem cells through Notch and BMP signaling pathways. Food. Chem. Toxicol 71(1), 60-67 (2014). Zhao HB, Ma H, Ha XQ, et al. Salidroside induces rat mesenchymal stem cells to differentiate into dopaminergic neurons. Cell. Biol. Int 38(1), 462-471 (2014). Herskovits AZ, Guarente L. SIRT1 in neurodevelopment and brain senescence. Neuron 81(1), 471-483 (2014). Joe I-S, Jeong S-G, Cho G-W. Resveratrol-induced SIRT1 activation promotes neuronal differentiation of human bone marrow mesenchymal stem cells. Neurosci. Lett 584(1), 97-102 (2015). Jahan S, Singh S, Srivastava A, et al. PKA-GSK3β and β-catenin signaling play a critical role in trans-resveratrol mediated neuronal differentiation in human cord blood stem cells. Mol. Neurobiol (2017). N1 T, WX S, Luo J ea. BMP-9-induced osteogenic differentiation of mesenchymal progenitors requires functional canonical Wnt/β-catenin signalling. J. Cell. Mol. Med 13(1), 2448-2464 (2009). H C. Wnt/β-catenin signaling in development and disease. Cell 127(1), 469-480 (2006). JA F, TC D. Glycogen synthase kinase 3: a key regulator of cellular fate. Cell. Mol. Life. Sci 64(1), 1930-1944 (2007). S S, C J, AC C, et al. A cAMP-activated pathway, including PKA and PI3K, regulates neuronal differentiation. Neurochem Int 44(4), 231-242 (2004). Nan C, Guo L, Zhao Z, et al. Tetramethylpyrazine induces differentiation of human umbilical cord-derived mesenchymal stem cells into neuron-like cells in vitro. Int J Onc 48(1), 2287-2294 (2016). Chen S, Fariss RN, Kutty RK, et al. Fenretinide-induced neuronal differentiation of ARPE-19 human retinal pigment epithelial cells is associated with the differential expression of Hsp, 70(1), 14–3–3, pax-6, tubulin beta-III, NSE, and bag-1 proteins. Mol. Vis 12(1), 1355–1363 (2006). Zhao YC, Xin J, Sun CH, et al. Safrole oxide induced neuronal differentiation of rat bone-marrow mesenchymal stem cells by elevating Hsp70. Gene 509(1), 85-92 (2012). Wang Y, Deng Z, Lai X, et al. Differentiation of human bone marrow stromal cells into neural-like cells induced by sodium ferulate in vitro. Cell.Mol. Immunol 2(1), 225-229 (2005). JS dS, CG D. Breaking the neuronal sphere: Regulation of the actin cytoskeleton in neuritogenesis. Nat. Rev. Neurosci 3(1), 694-704 (2002). Read DE, Gorman AM. Involvement of Akt in neurite outgrowth. Cell. Mol. Life. Sci 66(1), 2975-2984 (2009). Zhou FQ, Snider WD. Intracellular control of developmental and regenerative axon growth. Philos. Trans. R. Soc. Lond. B. Biol. Sci 361(1), 1575-1592 (2006). Price RD, Milne SA, Sharkey J, et al. Advances in small molecules promoting neurotrophic function. Pharmacol. Therapeutics 115(1), 292-306 (2007). McAllister AK. Neurotrophins and neuronal differentiation in the central nervous system. Cell. Mol. Life. Sci 58(1), 1054-1060 (2001). D V, PJ S, P L, et al. Signaling pathways for PC12 cell differentiation: Making the right connections. Science 296(1), 1648-1649 (2002). MJ P, PJ S. Sustained activation of extracellular signal-regulated kinase by nerve growth factor regulates c-fos protein stabilization and transactivation in PC12 cells. J Neurochem 99(1), 1480-1493 (2006). J C, H K, Y O, et al. Timing-dependent actions of NGF required for cell differentiation. PLoS. One 5(1), e9011 (2010). Reichardt LF. Neurotrophin-regulated signalling pathways. Philos. Trans. R. Soc. B 361(1), 1545-1564 (2006). U R, E Z, M H. Militarinone A induces differentiation in PC12 cells via MAP and Akt kinase signal transduction pathways. FEBS. Lett 577(1), 455-459 (2004). SV M, H K, SM K, et al. 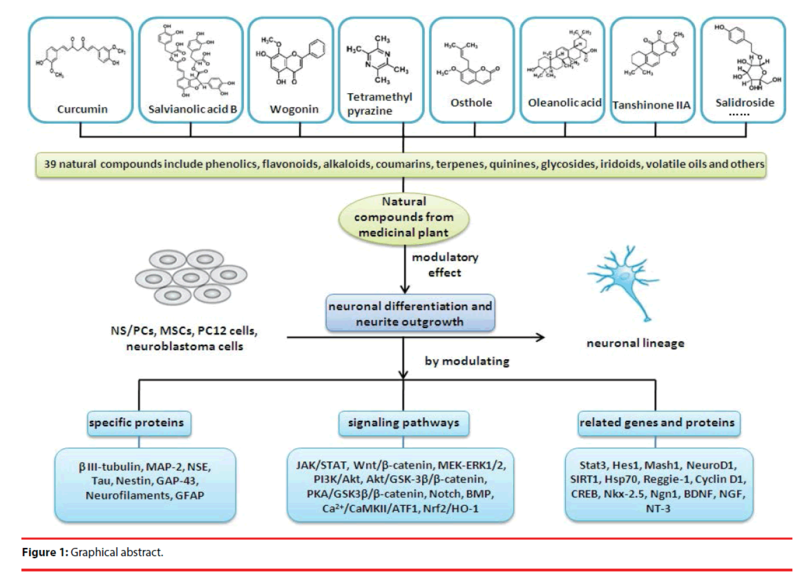 Advances in neuroprotective ingredients of medicinal herbs by using cellular and animal models of Parkinson's disease. Evid Based Complement Alternat Med 2013(1), 957875 (2013). Yanaka N, Nogusa Y, Fujioka Y, et al. Involvement of membrane protein GDE2 in retinoic acid-induced neurite formation in Neuro2A cells. FEBS. Lett 581(1), 712-718 (2007). Tang G, Dong X, Huang X, et al. A natural diarylheptanoid promotes neuronal differentiation via activating ERK and PI3K-Akt dependent pathways. Neuroscience 303(1), 389-401 (2015). Read DE, Gorman AM. Involvement of Akt in neurite outgrowth. Cell. Mol. Life Sci 60(1), 2975-2984 (2009). Sakamoto K, Karelina K, Obrietan K. CREB: a multifaceted regulator of neuronal plasticity and protection. J. Neurochem 116(1), 1-9 (2011). Park S-J, Jin ML, An H-K, et al. Emodin induces neurite outgrowth through PI3K/Akt/GSK-3β-mediated signaling pathways in Neuro2a cells. Neurosci. Lett 588(1), 101-107 (2015). Venkatesan R, Shim W-S, Yeo E-J, et al. Lactucopicrin potentiates neuritogenesis and neurotrophic effects by regulating Ca2+/CaMKII/ATF1 signaling pathway. J Ethnopharmacol 198(1), 174-183 (2017). Ohnuma K, Hayashi Y, Furue M, et al. Serum-free culture conditions for serial subculture of undifferentiated PC12 cells. J. Neurosci. Met 151(1), 250-261 (2006). Zhao J, Cheng YY, Fan W, et al. Botanical drug puerarin coordinates with nerve growth factor in the regulation of neuronal survival and neuritogenesis via activating ERK1/2 and PI3K/Akt signaling pathways in the neurite extension process. CNS. Neurosci. Therapeutics 21(1), 61-70 (2015). GA H, EJ M. NGF receptor gene-expression is decreased in the nucleus basalis in Alzheimers-disease. Experimental. Neurol 106(1), 222-236 (1989). D V, PJS S, P L, et al. Signaling pathways for PC12 cell differentiation: Making the right connections. Science 296(1), 1648-1649 (2002). Lam KYC, Chen J, Lam CTW, et al. Asarone from Acori Tatarinowii Rhizoma potentiates the nerve growth factor-induced neuronal differentiation in cultured PC12 cells: A signaling mediated by protein kinase A. PLoS. One 11(1), e0163337 (2016). Perrone-Bizzozero NI, Cansino VV, Kohn DT. Post-transcriptional regulation of GAP-43 gene expression in PC12 cells through protein kinase C-dependent stabilization of the mRNA. J. Cell. Biol. 120(2), 1263-1270 (1993). Schimmelpfeng J, Weibezahn KF, Dertinger H. Quantification of NGF-dependent neuronal differentiation of PC-12 cells by means of neurofilament-L mRNA expression and neuronal outgrowth. J. Neurosci. Methods 139(1), 299-306 (2004). Liao KK, Wu MJ, Chen PY, et al. Curcuminoids promote neurite outgrowth in PC12 cells through MAPK/ERK- and PKC-dependent pathways. J. Agri. Food. Chem 60(1), 433-443 (2012). WJ F, LA G. Neurotrophin signaling via Trks and p75. Exp. Cell. Res 253(1), 131-142 (1999). GX S, H R, DA A. A novel cyclic AMP-dependent Epac-Rit signaling pathway contributes to PACAP38-mediated neuronal differentiation. Mol. Cell. Biol 26(1), 9136-9147 (2006). LA G, DR K. Early events in neurotrophin signalling via Trk and p75 receptors. Curr. Opin. Neurobiol 5(1), 579-587 (1995). MA Y-z, NING N, HE W-b, et al. Claulansine F promotes neuritogenesis in PC12 cells via the ERK signaling pathway. Acta. Pharmacologica. Sinica 34(1), 1499-1507 (2013). Cheng L, Ye Y, Xiang L, et al. Lindersin B from Lindernia crustacea induces neuritogenesis by activation of tyrosine kinase A/phosphatidylinositol 3 kinase/extracellular signal-regulated kinase signaling pathway. Phytomedicine 24(1), 31-38 (2017). Koch JC, Solis GP, Bodrikov V, et al. Upregulation of reggie-1/flotillin-2 promotes axon regeneration in the rat optic nerve in vivo and neurite growth in vitro. Neurobiol. Dis 51(1), 168-176 (2013). Lu Z, Shen Y, Wang T, et al. Curcumin promotes neurite outgrowth via reggie-1/flotillin-2 in cortical neurons. Neurosci. Lett 559(1), 7-12 (2014). Liu J, Zheng X, Yin F, et al. Neurotrophic property of geniposide for inducing the neuronal differentiation of PC12 cells. Int. J. Devl Neurosci 24(1), 419-424 (2006). Yang X, Li W, Prescott ED, et al. DNA topoisomerase II beta and neural development. Science 287(1), 131-134 (2000). Lok CN, Lang AJ, Mirski SEL, et al. Characterization of the human topoisomerase IIbeta (TOP2β) promoter activity: essential roles of the nuclearfactor-Y (NF-Y)- and specificity protein-1 (Sp1)-binding sites. Biochem. J 368(1), 741-751 (2002). Silvestre-Roig C, Fernandez P, Esteban V, et al. Inactivation of nuclear factor-Y inhibits vascular smooth muscle cell proliferation and neointima formation. Arterioscler. Thromb. Vasc. Biol 33(1), 1036-1045 (2013). Hong IK, Byun HJ, Lee J, et al. The tetraspanin CD81 protein increases melanoma cell motility by up-regulating metalloproteinase MT1-MMP expression through thepro-oncogenic Akt-dependent Sp1 activation signaling pathways. J. Biol. Chem 289(1), 15691-15704 (2014). Yan Y, Zhao J, Han S, et al. Tetramethylpyrazine induces SH-SY5Y cell differentiation toward the neuronal phenotype through activation of the PI3K/Akt/Sp1/TopoIIβ pathway. Eur. J. Cell. Biol 94(1), 626-641 (2015). YAN Y, ZHAO J, CAO C, et al. Tetramethylpyrazine promotes SH-SY5Y cell differentiation into neurons through epigenetic regulation of Topoisomerase IIβ. Neuroscience 278(1), 179-193 (2014). Jeffrey P, Summerfield S. Assessment of the blood-brain barrier in CNS drug discovery. Neurobiol. Dis 37(1), 33-37 (2010). Abbott NJ. Blood-brain barrier structure and function and the challenges for CNS drug delivery. J. Inherit. Metab. Dis 36(1), 437-449 (2013). Brasnjevic I, Steinbusch HWM, Schmitz C, et al. Delivery of peptide and protein drugs over the blood-brain barrier. Prog. Neurobiol 87(1), 212251 (2009). Gabathuler R. Approaches to transport therapeutic drugs across the blood-brain barrier to treat brain diseases. Neurobiol. Dis 37(1), 48-57 (2010). Zhang T-T, Li W, Meng G, et al. Strategies for transporting nanoparticles across the blood-brain barrier. Biomater. Sci 4(1), 219-229 (2016).